I belong to several online email groups and enjoy “hearing” what other quilters from around the world are doing. Last week, one group member wrote a very eloquent and poignant email to the group. I was truly touched by what she wrote. I contacted her, and with her permission, I am posting her email below. Cindy’s note: If you do not belong to an online email group, I would highly recommend it. I belong to several YahooGroups, specifically the Gammill Users Group (the brand of my quilting machine) and the Machine Quilting Professional (MQP) group. To join these groups go to www.YahooGroups.com and in the search box, type in the brand of your quilting machine, or the phrase “machine quilting.” From this list, choose the groups would like to join and follow the directions for joining each group. Soon you will be receiving emails from other quilters from all over the world! Today I was given the honor of quilting a quilt that was pieced by a customer who passed away a few weeks ago. I have quilted for her a number of times and I knew, like all of us, she had un-quilted tops stashed away waiting to be quilted one day. A friend of hers received this top from the husband of the deceased. Her friend decided to have it quilted and then she is donating it to a charity of her daughters, to be raffled. I enjoyed thinking about her today as I quilted this top. I thought about conversations we had over the years, funny how things I remembered today about her would most likely have stayed buried in the deep chambers of my mind and maybe never thought of ever again had it not been for this quilt. This quilt will bring comfort in many ways to other people in the years to come, but today it gave me more comfort than my deceased customer would have ever thought possible. Today I was calmed by knowing someone would enjoy her work, the tranquil thoughts that passed through my mind’s eye of snatches of past conversations with her brought a smile and even a giggle or two. No, we were not great friends, just acquaintance who shared the passion of patchwork. I was also comforted in knowing that some of my unfinished work may one day be finished by an acquaintance or even someone whom I considered a friend. I just hope they will remember me as fondly as I remembered this lady today and that even when I am gone…..my quilts will talk to someone like this quilt did to me today. Our passion for quilting really is our legacy to be shared by those who are lucky enough to understand all the love and hard work that goes into the cutting up and piecing back together each section of cloth. What more can anyone say! Feel free to contact Sue at the contacts above and please post a comment to this blog. A few days ago I received an email from a machine quilter who wanted some information on two issues. One issue was raising her prices for her machine quilting services and the second issue was what to do about the time and $$ it was costing her to pick up and deliver her customer quilts. Raising her prices wasn’t hard and she came up with a price change that she was comfortable with. The second issue, about delivering quilts, became a little more complex. Here is her situation – she lives in a very rural area. Some of her customers will come to her home studio to drop off and pick up quilts, but many, if not most, of her customers drop off their quilts at several different (relatively) local quilt shops. She says the closest quilt shop is an hour’s drive away from her home and other quilt shops are up to another hour’s drive from the first quilt shop. She says she usually goes to these quilt shops once a week, on a specified day, usually arriving about the same time. We talked a bit about this and came up with some ideas, but she has to decide if, how, and when, she wants to implement them. Over the last few days I have been thinking about all this and I have a few more ideas and would like to share them with you all. The first thing to do is to determine how many of her customers utilize her delivery services, how many quilts are involved and how much $$ she makes this way. Cindy’s note: do not assume that the quilt shop with the most number of quilts has the most amount of $$$. Quilt shop #2 may take in 10 baby quilts for a much lower (total) $$ amount than Quilt shop #1 with only three Queen Size quilts for a much higher (total) $$ amount. She may also be able to determine if there is a pattern for the dates, or time of the year, when there are more or less quilts to pick up or deliver. There may be fewer quilts for pickup and delivery during the summer and more in the autumn and before Christmas. There may be other information that will become obvious when the details of the quilts and customers are documented. Make fewer trips to the quilt shops during “slow” times – according to her documented chart. Call ahead to the quilt shop to see if there are any quilts waiting for her to be picked up. If no quilts are waiting, she may not go to that quilt shop on that particular day. Start charging a delivery fee for each quilt that is picked up or dropped off at a quilt shop. During the course of our conversation, she did say that several of her customers do ship their quilts to her. She would then drop off the finished quilt at the quilt shop or ship the finished quilt back to the customer. At this time, she does not have any shipping fees added to her prices to cover return shipping costs. This quilter is considering adding a fee to cover both the cost of her gas and time, for picking up, delivering or shipping her customer’s quilts. Let’s play with some assumptions and numbers to see if we can determine a reasonable fee for these extra services. Assumption #1 – Time and Travel – quilt shop #1 is 40 miles from her home studio and takes 1 hour to travel, one way, to this quilt shop. Let’s also assume that she spends an hour at the quilt shop talking with her customers that are waiting for her and with the shop owner and other potential customers. That makes a total of 3 hours – 1 hour to, 1 hour at, and 1 hour back from the quilt shop. Let’s assume she wants to make $20 per hour while she is doing this for a total of $60. Assumption #2 – Travel Expenses – Let’s also assume that her vehicle gets 20 miles per gallon and that gas is $4 per gallon. She will need 4 gallons of gas for the round trip to the quilt shop – 40 miles x 2 = 80 miles divided by 20 mpg = 4 gallons x $4 per gallon = $16. Let’s also add an extra $4 for the extra wear and tear on the vehicle. (I realize that this may be a very low amount.) This would total $20. Assumption #3 – Totals – Let’s add the $60 for her time and the $20 for her gas for a total of $80 minimum she should make for this trip to the quilt shop. What about customer reaction? Will there be some upset customers? Yes. Will the customers continue to use this quilter? Probably. Will a few customers decide to take their quilts to another quilter that does not have any delivery fees? Yes – but, these will not be your “best” customers – these customers who are probably looking for the cheapest, most convienient to them, quilter. Remember, this quilter is also raising her prices, so the double whammy of raised prices and a delivery fee would push these “iffy” customers away. That’s all right. That will leave LOTS of room for the GOOD customers who appreciate the work, craftsmanship and artistic vision this quilter brings to their quilts. There can be some options that the customers can utilize. They can ship their quilts to the quilter and they would be billed a delivery fee only. The customer could make the drive to and from the quilter’s studio themselves and they pay for their own gas and time. Maybe after doing this a few times, the customer will gladly pay the pick up /delivery fee. 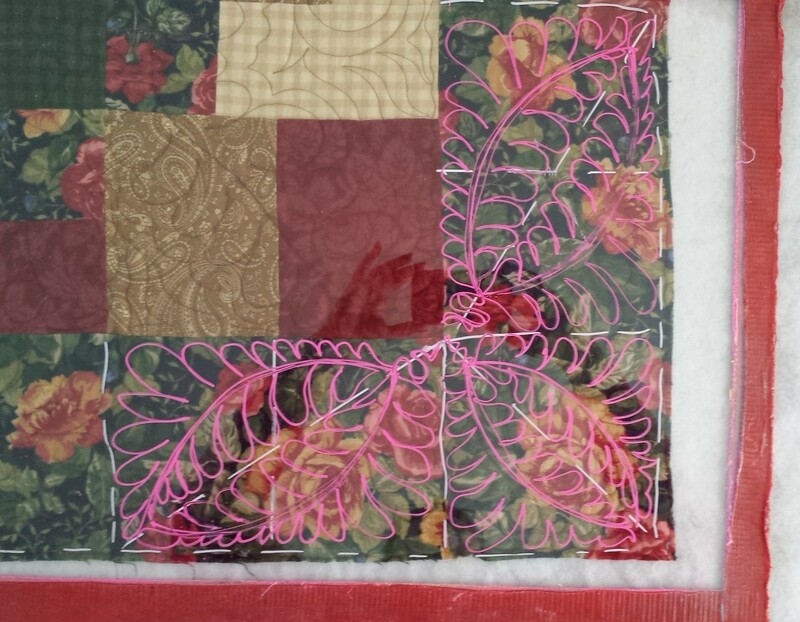 The customer could ship their quilt to the quilter and then have the quilter ship the completed quilt back to them. If this is an option, I would make sure the return shipping fee is at least the same amount as the delivery fee. Cindy’s note: I would bet that the return shipping fee, for a completed Queen Size quilt, via USPS Priority Mail, Delivery Confirmation, would be MORE than the delivery fee. The above are my thoughts and ideas about a pick up / delivery fee for this particular machine quilter. Here are my questions to you – Do you have a business situation similar to this? Do you have a delivery fee? If you do, how much is it and how did you determine this fee? If you don’t have a delivery fee, let us know why. I would love to hear your thoughts about this issue and this particular situation. Please feel free to post your comments.